Legacy EDH is an attempt to create a competitive 1V1 Commander format. It using the Legacy banned list, it cuts out a lot of degenerate combo and mana acceleration cards. Note that in Shambling Strider's banned list, a few extra cards, such as Karakas, Rofellos, and Clique are also banned. By switching to 20 life it opens up aggro as a viable archetype. 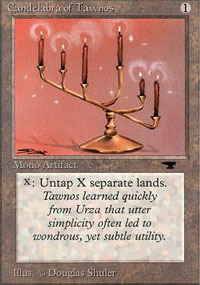 I think, if there was to be any form of competitive EDH format, this would be the one. Haven't the French already set up a good 1v1 system? yes. There are few holes in it but overall it works quite well. There are situations Sol Ring is worse than Sisay's Ring. Ratchet Bomb would kill the Ring faster than Sisay. If all players/sides agree to houserules and know the game, it should be fine.